On Stage Lighting returns from two days of too much walking, too much talking and a certain amount of beer to bring you the essential features of the the PLASA London show 2009. We take you to the places on the floor the industry publications don’t reach and look behind the smoke and mirrors. A year seems to pass so quickly. This week, it was time for scores of backstage ferrets to emerge from the darkness and make the journey to Earl’s Court for PLASA once more. Techies don’t go to shows if they can help it but the promise of free beer and nibbles, and maybe the odd LED to be blinded by, is usually reason enough to get out of show blacks and into a different darkened room for a few hours. Exhibitors stands spread from EC1 to a large part of EC2, but the “whose got the biggest stand” competition seems to have taken a back seat – for this year at least. What doesn’t seem to have waned is a tendency to fill your stand with vast high power LED arrays, making it much harder for the punters to examine the goods. Perhaps the stand designers need to revisit Lighting Design 101 – Contrast and it’s importance for visibility. 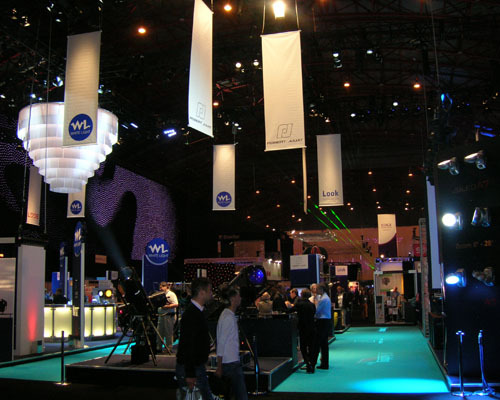 Whether less visitors attended PLASA 09, it’s difficult to say but the atmosphere was a lot less hectic and the stands not so crowded. There were also a number of “regular” exhibitors who were notable by their absence. It may come as no surprise, but LED lighting technology continues to feature heavily in the world of fixture making and each year we seem to have a different mode. OK, so this isn’t London Fashion Week but a few years ago we had LEDs on drapes/webbing and LED backlighting systems such as the Martin EvenLED and Schnick-Schnack-Systems. 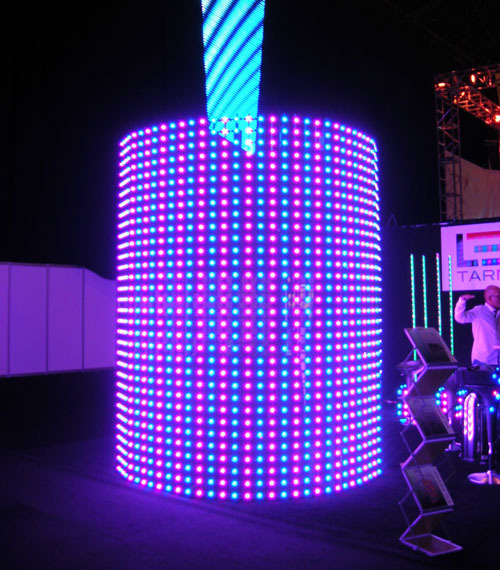 Panels built on the concept of semi tranparent arrays for media content replay (such as the Martin LC panel) by bending strips and tubes into curved formations and creating 3D LED surfaces. So, curvy arrays – everyone seemed to have one. Heads have also turned toward improved colour output, with many LED fixture makers boasting better colour rendition. Studio Due showed a new version of the ArchiLED, with improved 4 cell LEDs replacing the individual RGBA ones. Many other high quality LED “bosh” lights were given pride of place including the i-Pix range and the Selador / ETC wash light. I don’t think that the Selador made it to PLASA last year but I was lucky enough to see an early model in the UK round the back of some grotty industrial estate – it featured on the plush ETC stand this year. The feature of the Seledor is that it uses 7 different LED colour sources instead of the common RGB / RGBA (with amber) / RGBW (with white) giving the colour range a boost. Lighting designers have a requirement for in better colour rendition in LED fixtures and the manufacturers have definitely worked hard in this area. Other things of note in the LED area were the Vari*lite VLX high power LED wash light and a great little LED moving spot with excellent optics. The Highlight Showtec features a 27 LED array which is (somehow) focussed down to a spotlight capable of projecting gobos and is bright enough to compete with a standard 250w discharge sourced moving spot. At the control end, console creators have been busy refining their current offerings. Not too many “brand new shiny things” rather more backend changes that make real users happy. A major version upgrade hits the Jands Vista software AKA start the code from scratch. Jands decision to start again was to enable them to take the console where users wanted it to go and includes some improved timline editting and media server support. The development is the work of a structured team, part of a growing situation where lighting control developers emerge from the garden shed and embrace a more grown up approach to producing software. Changes at Cham Sys were even more subtle – moving toward using a solid state hard drive and Linux ProX which apparently is a “good thing”. Not really knowing much (or caring) about operating systems, I didn’t ask too many more questions. I also decided I wouldn’t ask Avolites whether the “new” thing this year was that the Pearl Expert / Titan software combination was finished and would now be making more friends among Avo users than it has since launch at PLASA08. Issues with hardware and software has currently left the Expert off many operators Xmas list, a situation that can take time to recover from as a manufacturer. Avo had a genuinely new toy to look at, which made for a more amicable discussion. The Tiger Touch and other associated touchscreen gubbins for the Expert are a major progression/departure/addition/choice (delete as appropriate) with regard to trad Avo User Interface. The new hardware removed many of the buttons and faders from a Pearl Tiger and replaced them with a touchscreen, additional encoder (now 3) and utilises the Titan software which now powers the Expert / Tiger Touch as well as the Diamond 4. It is also possible to create cue stacks on the playbacks. The more desk savvy of On Stage Lighting readers will be thinking “Touchscreen? Cue Stacks? So, is this Avo finally going down the Hog / GrandMA / Everybody else route.” While Avo says that the Touch concept represents control surface choice for the user, the more skeptical might say that they can see an user interface brick wall coming up with the traditional Avo hardware. In fact, this has been seen as the “elephant in the room”, to those of us outside of the company. How Avo users will react to the lasted hardware is not clear. The amount of choice in the desk market has created a certain amount of unseemly scrambling in recent years and history tells us that hasty releases by manufacturers often lead to woes further up the road. At the top end, MA Lighting was showing a more complete version of the MA2. Last year, the 2 on show was a lone trial desk. This year at PLASA, the MA stand was dripping with the black and yellow livery of the next generation Rolls Royce of lighting consoles. OK, Mercedes. While the old GrandMA was always a top end piece of kit, the Full size 2 gives the impression of German engineering in which no expense has been spared though I understand that the price ticket remains reasonable for a console of this quality. This is the single most comprehensive lighting control ever: Three 17” touchscreens, quicker responsive faders, lots of software additions, the list goes on – I think you would call it “feature rich”. Many of the features may provide a glimpse into the future of control surfaces, particularly the fourth touchscreen which is situated below the encoders and integral to the direct control of everything from attributes to FX ramps. A particularly good use is a draggable representation of beam shaping shutters that speeds up the control of modern fixtures. Endoders are great for some things, but this tactile/visual style must be at least part of the future . 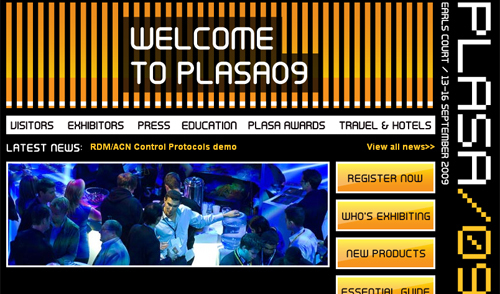 PLASA09 was also about all things wireless. Not only did a number of wireless DMX proponents command their own stands on the floor, a feature of many fixtures is inbuilt wireless capability. Coupled with LED light sources and battery power, wireless control featured in a number of LED products notably CORE Technolgies IP rated (water resistant) LED uplighter and Global Design Solutions Battery LED kit that includes in-flightcase smart charging and even a pack that enables charging via 2 solar panels. Wireless solutions for both power and control of lighting fixtures is an exciting development. Issues related to the availability of power is rarely to do with a lack of juice, more often difficulty in getting in power the right place – trailing cables everywhere is often not an option. Cable management aside, the time taken to install cabling constitutes a significant part of overall build time. Being able to sling out a load of uplighters and instantly have remote control of colour mixed light for the next twelve hours plus, is a plus in many situations. CORE and GDS (GDS using the same LEDs as the i-Pix) have the aformentioned high quality of colour output that is important to specifiers. On the wireless front, the L&SI sponsored Innvoations Gallery contained a number of wire free products including a motor hoist control and wireless RDM (Remote Device management) DMX traffic system. Wires are so last century. This year was the first opportunity for OSL to have a good look at the ( award winning, as of last night) Robe Robin series of moving heads, the key feature being a Plasma light source. The compact spot and wash lights are similar to 250w MSR/MSD powered head with a pleasing colour temperature and some nice optics. I am not sure I understand how a plasma lamp really works, but the unit was bright, cool and quiet. It also featured a touchscreen menu control for adjusting settings and an internal battery to enable a hire warehouse to set and address the fixture without having to plug into a mains supply. Look, no wires again. After the prototype debut at PLASA last year, the RSC sponsored Lightlock has found a manufacturer in Total Solutions. The Lightlock was designed as a means of solving the specific problem that moving heads create when attached to a small hanging structure such as a trapeze or pantograph. The unit is electrically powered and senses movement, attempting to eliminate it by creating an opposing force via a moving mass inside the unit. 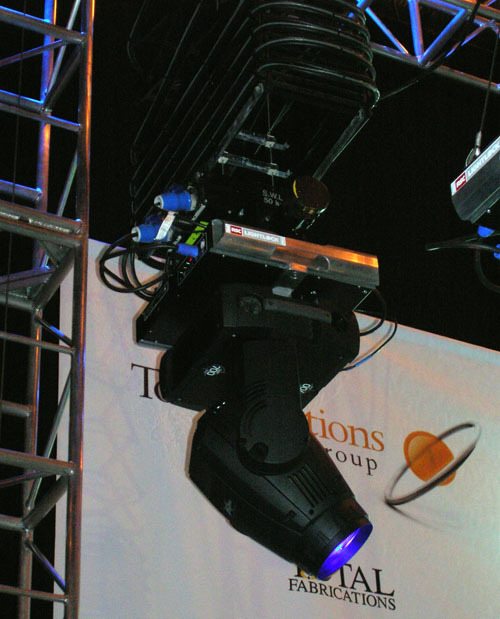 Although the problem seems pretty specialised, it does allow moving lights to be rigged in ways that have not been possible before and is particularly of interest to designers of TV studios, who use pantograph systems for easy overhead fixture suspension. The cost per unit, in relation to a moving light or pantograph for instance, does not look too outrageous if it allows a specific design problem to be solved. The unit that Total were showing looked totally different to the original show last year. As well as being a neater unit, I understand that a major revisit of the internal components was necessary to make the Lightlock a commercially viable piece of kit. Apparently, the production version is significantly more kinetically efficient too. It was good to see the Morpheus, granddaddy of “men in sheds” intelligent lighting, at PLASA for the first time. Showing their established multi stream CMY scroller system, they also brought the Pacific Fader CMY and dowser design specifically for the Selecon Pacific. While the world seems to be full of the ETC Source Four, the Selecon Pacific continues being a great profile spot which has either incandescent and discharge light sources. The Pacific Fader fits the gate of the Pacific, providing CMY and CTO graduated dichroic filters that are DMX controllable creating a wide range of high quality colours. Using a discharge light source, dimming is provided by a further graduated dichroic that a demonstation showed a really beautiful dimming quality. Sure beats mechanical shutters. On Stage Lighting readers unfamiliar with dichroic colour filters should know that rather than absorbing colour wavelengths, dichroic filters reflect them while the desired colours carry on through. A dichroic dimmer works in a similar fashion, reflecting different amounts of the whole spectrum. Anytronics were showing the AnyScene 2 which now boasts more DMX chann els and the ability run up to 8 panels in tandem. For the unitiated, the Anyscene is a great little panel that allows you to record DMX information via an input and then play it back by pressing one of the playback buttons on the front. This is ideal for installation where you want the end user to have limited control to your highly complex DMX controlled environment, having used the tools of your choice to set the scenes. Anyway, being able to slave up to 8 panels and give any panel control is a really useful addition. Our favourite product in the non lighting camp? We call it the Tape Trundler and it was an interesting piece of gear for the application of tape to a stage floor. Like a big parcel taping gun with a wheel and a long handle, the dispenser seemed like the answer to the prayers of anyone who had spent hours on their knees taping down Marley (AKA known as dance flooring). Now if you could incorporate laying cables and taping them down into that, I’m in. So that’s if for another year. The PLASA show is the accepted way to show off your latest innovations and is surely has to be given credit as a part of the engine that drives technology at the current manic rate. If the smoke and mirrors all get too much, there is always the option of stopping off at the AC Lighting stand and watching someone else make cables. So, did you get to PLASA this year. What really caught your eye? Comments in the box below as usual. I think that tape gun with a handle might have been the highlight of the show. As a first time visitor I can honestly say I was overwhelmed by what was there. I’ve learnt a lot just by having the chance to play with the kit on show, and now I wish I had a semi-decent budget for the shows I do. Ho hum. On the subject of ETC, what did you think of the Ion? I made a point of quizzing the stand rep about the Eos, but didn’t really look to hard at the Ion. I understand it’s similar but without the fancy hardware and I feel I got a handle on the Eos. Last year, the OSL PLASA Review mentioned new competition in the “Strand martket” in the form of the Zero88 Orb. ETC were way ahead in this particular game and the Eos/Ion seemed a real tempter if you come from a theatre/Strand programming background. To a serial Strander, th ETC system is the familiar friend, a desk you feel you could use and it certainly has the functions of a moving light console. So, for the Strand market it’s ideally placed. At some point though, many Strand users have an epiphany and realise there are pastures greener when it comes to control of moving lights (whether it be Hog, MA, Vista, etc) So, maybe that particular market is very gradually shrinking. I went to LDI (Live Design International) last Friday in Orlando, FL. I just read this post because I was curious to see how PLASA turned out. LDI was definitely slow this year. The show was smaller than the last time I went in 2007, and there weren’t as many attendees (at least on Friday). Some of the booths seemed to be scaled back, too. I am back to updating my lighting blog, since I finally have something new to talk about. You can look forward to a post where I complain about the ETC Element, the “little brother” of the EOS and ION! Hi Craig, great to hear from you again. You were one the original LDI show bloggers in 2007, before it was fashionable 😉 Looking forward to reading what you’ve got to say.